Roger and Bob, 1970's. Photo courtesy of Trinchero Family Estates. 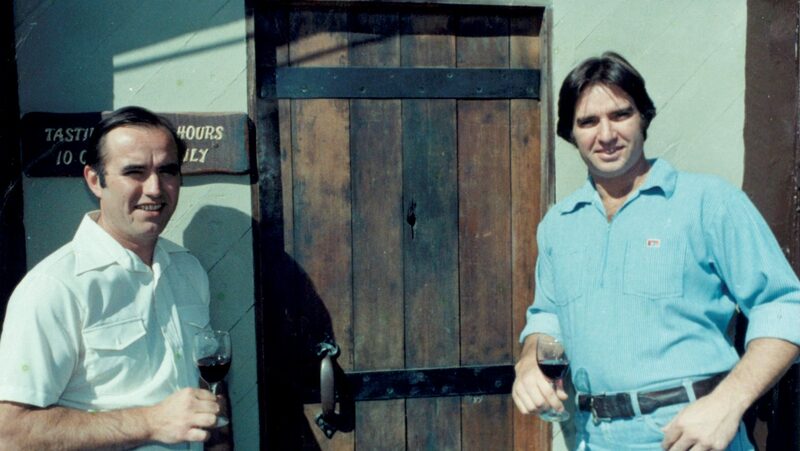 Bob and Roger standing in front of the cellar door. Photo courtesy of Trinchero Family Estates. Trinchero Winery. Photo courtesy of Trinchero Family Estates. Trinchero Pizza Room. Photo by David Matheson. 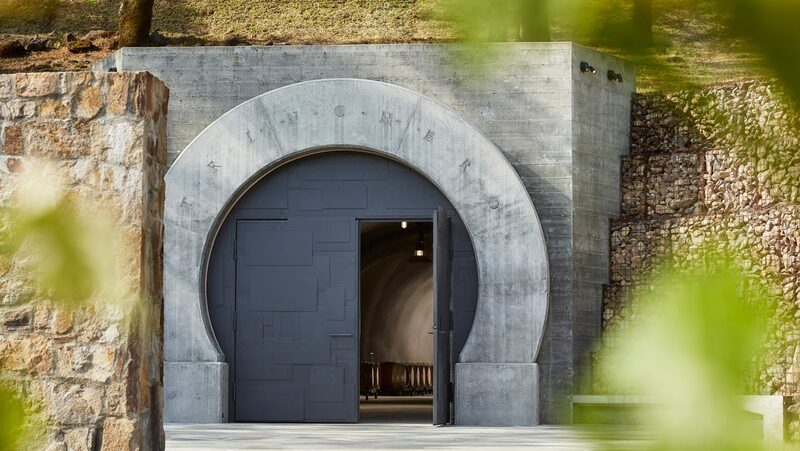 Wine cave entrance. Photo courtesy of Trinchero Family Estates. 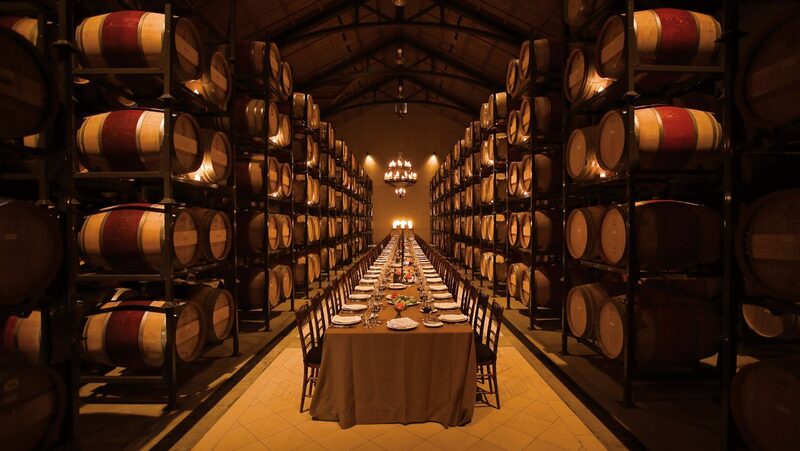 Trinchero Barrel Room Banquet. Photo courtesy of Trinchero Family Estates. Every four to six months, a group of the most venerated residents of Napa Valley gathers for lunch. Joseph Gallo, Mike Martini, Don Sebastiani Sr., and Fred Franzia are typically there, as are the benevolent ghosts of long-lived former members, like Frank Indelicato, John Parducci, Lou Foppiano, and Bob and Peter Mondavi. For two decades, these gentlemen, as well as a few ladies, have been calling themselves the Old Timers’ Club. Any American consumer would recognize most of the surnames in the room. 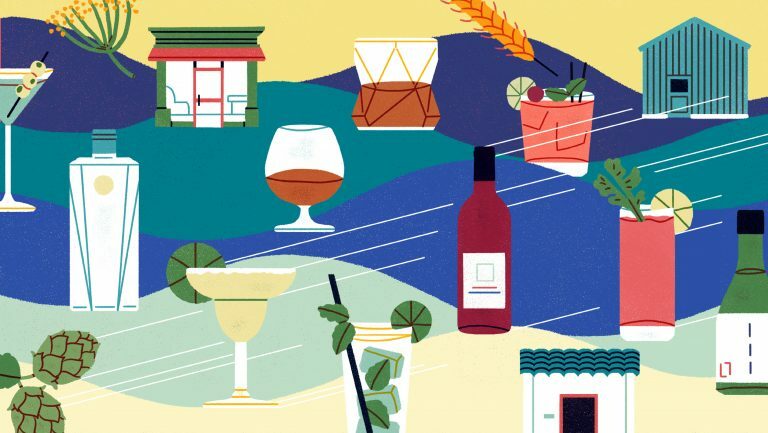 They’re mostly Italian, and they mostly come with superlatives attached: Gallo is the biggest, Franzia the most cutthroat, Mondavi the one with international cachet, and so on. But what about those other two gentlemen of Italian descent? The Trinchero brothers, Bob and Roger, are 81 and 71 years old, respectively. And they have plenty of superlatives going for them. Trinchero Family Estates (TFE) is the second largest family-owned winery in the world. It also happens to be the fourth largest winery in the United States. Scions of one of the nation’s most important Italian families, wielding untold power and wealth within the wine industry, the Trincheros have made an indelible mark on the American trade. But who are they, again? Success came to the Trincheros in the same way it came to so many of the Old Timers’ Club members: on discount-supermarket shelves. Fred Franzia got his start with the Franzia boxed-wine business. The Indelicatos made their name with Delicato Shiraz. Gallo Family Vineyards is a mainstay at Walmart. And so on. For the Trincheros, the supermarket was also the conduit, but the breakthrough wasn’t a brand. Rather, it was a specific style of wine, one that had never before been produced. Then, in 1975, an accident happened. The fermentation of Trinchero’s saignée-method rosé got stuck, rendering a semisweet (not dry) pink wine. He bottled it anyway. 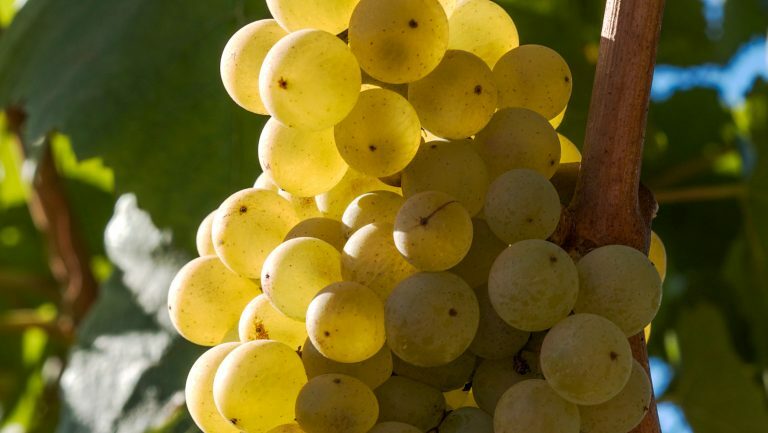 White Zin as we know it was born. And it was a hit. 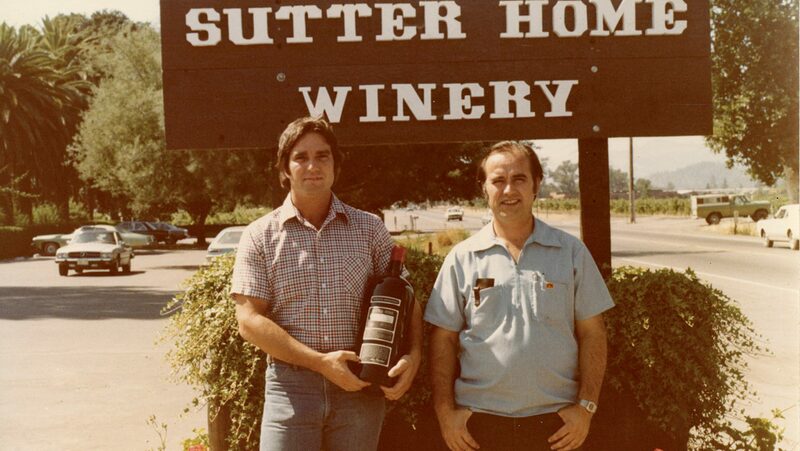 The early success of Sutter Home White Zinfandel was largely fueled by word-of-mouth recommendations. It was not until 1987 that the Trincheros held their first official sales meeting, which, fittingly, took place in Bob Trinchero’s backyard. By that point, Sutter Home White Zinfandel was America’s best-selling wine, with annual production at 2 million cases. Surprisingly, even though White Zin has fallen out of fashion today, sales haven’t dipped since the late ’80s. Enough of us, apparently, have grandmothers and aunts out there (here’s looking at you, Aunt Barb!) to have kept Sutter Home White Zin clipping along at those millions of cases annually. Even in 2017, the year of dry rosé mania, Sutter Home White Zin was the best-selling pink wine in the U.S. in the $10-and-under range. The winery, which now sells 10 million cases of pink, white, and red wine annually, was originally founded in 1874 by a Swiss-German immigrant, then shut down during Prohibition. In 1948, John and Mario Trinchero, brothers from Italy who’d arrived in New York City, purchased the winery—name and all—just across the road from the Louis M. Martini winery in St. Helena. They made simple bulk wines and sold them to Napa Valley locals. When John Trinchero retired, in 1960, he turned the winery over to his brother. That same year, Mario’s son Louis “Bob” Trinchero (his mother, Mary, who never liked the name Louis, called her son Bobby, and it stuck) took over as winemaker. Roger, the first Trinchero to attend college, returned from military service in Vietnam in 1972 to lead sales and distribution and help Bob with marketing and production. In 1985, while a generation of culture snobs, fueled by Julia Child, among others, were mainlining pâte and Sauternes, the Trincheros began publishing a newsletter aimed at the 99 percent. The newsletter offered various information, including help with wine pairings: Which Sutter Home varietal tasted best with peanut butter? White Zinfandel. Which with popcorn? Chardonnay. Where can one buy peanut butter and popcorn? The supermarket. Where Sutter Home is sold. A similarly savvy move was the Trincheros’ prescient early investment in what has become a common sight these days—the single-serving bottle, or “split.” The Trincheros commissioned research in the 1980s that determined that the increasing number of American adults living alone were hesitant to purchase full-sized bottles of wine for themselves. The only single-serving sizes available at that time were the plastic 187 ml bottles used by airlines, so Roger Trinchero custom-ordered a small glass bottle mold for Sutter Home. Today, Sutter Home sells more than half of all 187 ml–sized wines in the United States. While the brothers’ common touch bankrolled the business, they pivoted in the new millennium. 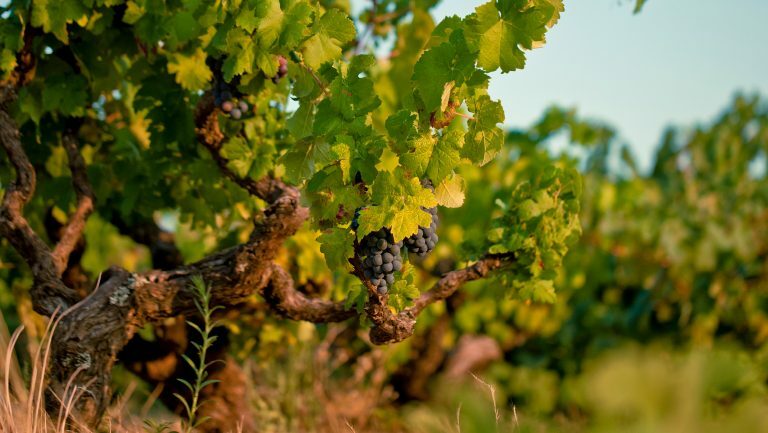 Noting an increasing interest among consumers in higher-end wines, they struck partnership deals with respected Napa Valley names like Neyers Vineyards, Ziata, and Joel Gott. 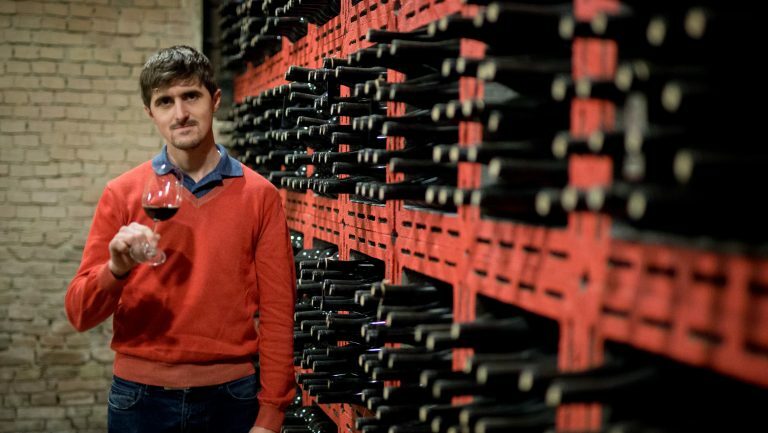 In a brilliant move, however, they secured the middle ground between bargain bottle and luxury label: In 2004, they purchased a well-situated Sonoma winery, Folie à Deux, for $16 million. The price looked high for an operation with a total annual production of about 30,000 cases. Folie à Deux came with a second label, called Ménage à Trois—a name that sounds silly now but was shockingly irreverent at the time. “Ménage à Trois was clever when it was invented in 1996. The public might not have been ready for a wink and a nod any earlier,” observes Tim McDonald. The Trincheros saw the value of that wink and knew, given the success of The Prisoner, they could turn Ménage à Trois into a hit. As with The Prisoner, the wine’s name stopped shoppers in their tracks. And as with The Prisoner, it was a plush red blend. But unlike The Prisoner, it was priced for the wine-curious shopper ready to trade up from the jugs on the bottom shelf at the grocery store. Today, the red blend is the third-largest wine category in the U.S., and within it, Ménage à Trois Red is the top seller, at more than 1.5 million cases annually. Ménage à Trois is TFE’s second-largest brand after Sutter Home, accounting for a total of 3 million cases in annual sales, with bottles priced at $10 to $15 retail. The icing on the cake was the early adoption by TFE of quirky, youthful lines, like Bandit, that captured the millennial vibe while staying in the supermarket price point. A partnership with Charles & Charles was a coup; the brand, helmed by two irreverent industry icons who exemplify the new face of wine, just happens to produce one of the best-selling rosés in the $10–$13 price range. The Trincheros have cornered the market on pink. A decade ago, TFE debuted a new winery in St. Helena at the address of the former Folie à Deux winery. 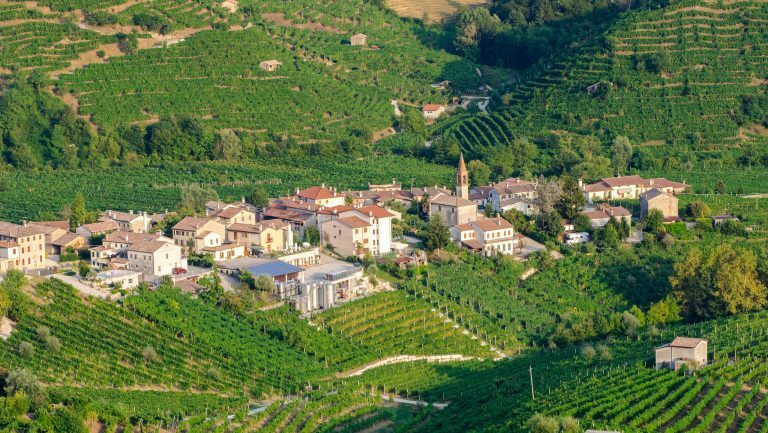 Winemaker Mario Monticelli, who earned his chops at the neighboring Melka Estates and Antinori in Chianti, Italy, makes plush, powerful Bordeaux-style reds there that range in price from $50 to $200 and have received critical scores in the ‘90s. The winery’s name? Trinchero Napa Valley. Trinchero Napa Valley is a departure for a company that made millions matching wine with burgers and popcorn. 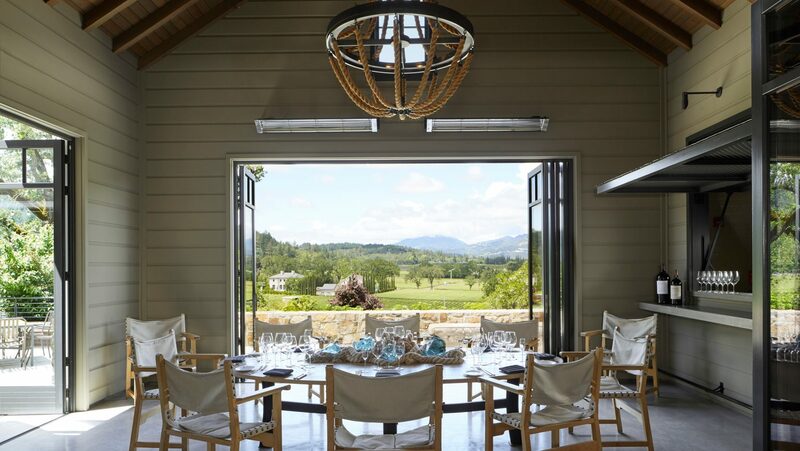 The winery’s new hospitality center, which debuted in June 2016, is sumptuous—outfitted like a contemporary hunting lodge, with private dining spaces, a members’ lounge, a secluded bocce court, and an air of sophisticated mystery. In an arresting corner of the grand tasting room, two steampunkish rolling carts stand in front of a parchment-colored wall. Each cart is a tasting station, supporting a clear glass tube of soil, a horn chalice, and an egg-shaped concrete vessel stamped with the letters TNV and filled with wine. Behind the carts are charcoal sketches by decorative painter Michael J. Duté that depict the zodiac symbols of the Trinchero family, along with winemaking diagrams. White Zin and peanut butter have no place here. Torres remains principal, vice chairman, and director of executive administration at Trinchero Family Estates, while his brother Tony plays a similar role with the business. In May 2017, Roger Trinchero announced the appointment of longtime Trinchero executive—and non–family member—Bob Torkelson to the position of president and CEO, with Roger retiring from that role but remaining as chairman of the board of directors. Meanwhile, Roger’s son Carlo—whose star rose quickly when he launched the Taken brand in partnership with Josh Phelps, the son of the well-known and Bordeaux-trained Napa Valley winemaker Chris Phelps—made headlines when he was arrested in May 2016, and sentenced in February 2017, on domestic violence charges. A month after Carlo Trinchero’s sentencing, Phelps announced that he had sold his share of Taken to TFE. Then in October, wildfires ravaged Napa Valley and Sonoma County, displacing many TFE employees. The Trinchero brothers showed their true colors. They donated $250,000 to the Napa Community Foundation to aid in fire relief and recovery efforts. Trinchero Family Estates fed and outfitted first responders with supplies, supported employees who had been left homeless, donated all proceeds from tasting fees at TFE wineries through November 30, and matched employee donations, 2 to 1, to the Trinchero Family Estates Family in Need Fund, which directly helped team members affected by the fires. Bob and Roger Trinchero have long been acknowledged in the Napa Valley community as generous philanthropists and benevolent employers. When they received the Wine Enthusiast Wine Star Award for lifetime achievement in September 2017, their peers cheered them on. “They run a very good organization and they are very nice people. 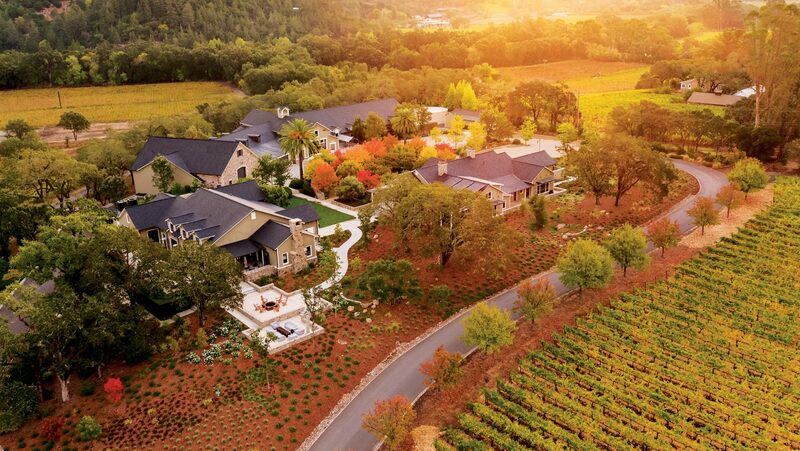 I think that they are truly the American success story,” says Eric Wente, an Old Timer and the fifth-generation proprietor of the country’s oldest continuously operated family-owned winery, Wente Vineyards.